Well done, Moody Park Residents’ Association, well done. In 1890 David McLaughlin purchased some land in New Westminster near the newly-created Moody Park. It’s rumoured that he, being a ship’s carpenter and handy with building things out of wood, built the house that still stands on that property today at 1031 Sixth Avenue. The house is typical of those of the time, in a simplified Queen Anne style with ‘Victorian’ features such as an asymmetrical floorplan, bay windows with decorative cast iron cresting, and mansard roofs. It’s also remained relatively untouched over its 125-year lifetime, with the only major renovation being the addition of a workshop by McLaughlin himself in 1915. So when the current owner wanted to expand living space for his family, he applied for a demolition permit to build a larger house on the site. As the house is on the City of New Westminster’s Heritage Register the permit was immediately put on hold pending the issuance of a building permit that authorizes the construction of a building to replace the building that is being demolished (City of New Westminster Heritage Procedures Bylaw No. 7606, 2013). This brought the pending demolition to the city’s attention, and council directed city staff to determine how the heritage house could be saved. The owner of the property then agreed to enter a Heritage Revitalization Agreement (HRA), and had plans developed that would move the heritage house to the rear of the lot and raise it by 11 inches to allow for a new foundation and crawl space, and adding a new house at the front of the lot. The new house would be approximately 2160 square feet (footprint of 887 square feet), with the heritage house being approximately 1500 square feet (footprint of 800 square feet). These plans are found in the March 14, 2016 Council meeting minutes. These plans didn’t meet all of the criteria for a standard HRA, as the heritage house would become “subordinate” to the new house. Also, it’s roughly twice the size of what a standard laneway house would be and it wouldn’t visually address the lane behind the property. Despite these shortcomings, city staff recommended that the HRA continue through the process as it would protect the historically significant house. Concerns were expressed about the size (height and massing) of the historic house, its setback from the lane, the over view into the neighbours’ rear yards from the historic house, and allowing two houses on one property with its accompanying higher density. Many were concerned that this proposal would set a precedent for future laneway houses. Some expressed concern about the lack of off-street parking and others about the low visibility of the heritage house from the street if it were relocated to the rear of the lot. The Moody Park Residents’ Association then voted against the application. Because of this lack of support from the neighbourhood, the owner is withdrawing the HRA and is renewing his request for a demolition permit, which New Westminster Council granted. New Westminster residents have been crying out about heritage houses being torn town in our city for years now. People always complain when an old house is torn down to have a larger house be built in its place. So when it comes time to preserve a historically significant house, one that was built before 1900, you would think that people would jump at the chance. Unfortunately the NIMBYs in Moody Park don’t seem to care about preserving the history in our city. They would rather complain that the house already on the property is too high and would overlook their back yards more than it already does, even though the house would be positioned such that walls with fewer windows would have faced the closest properties. They would rather complain about a lack of off-street parking because they might lose one or two on-street parking spots. They would rather complain about low visibility of the historic house, even though the alternative is demolishing the historic house. I highly suspect that the major driver behind this is the ongoing Official Community Plan consultations. A few months ago the president of the MPRA got a bunch of Moody Park residents’ hackles up when he sent out an email and handed out pamphlets strongly implying that the city was planning to force laneway houses (or worse — QUADPLEXES AND TOWNHOUSES!) down their throats after the OCP had finished. This resulted in a huge amount of pushback from Moody Park residents against the entire densification story that’s hitting Metro Vancouver lately, and this is seen here as well. I quote again: “Many were concerned that this proposal would set a precedent for future laneway houses.” I would love to check the MPRA’s minutes for this meeting but unfortunately they’re stuck in 1991 and don’t have a website. So instead of preserving a house that was built 125 years ago by moving it and adding a single house to the neighbourhood, Moody Park Residents’ Association members would rather see that historical house be demolished. Jonathan Cote can control the weather! Yeah, Council was arguing about what sort of weather we were going to have today but I pushed the nice weather through. And as proof of his benevolence? The forecast for Sunday, May 24, when the “ousted” Royal Lancers are holding their community heritage picnic? Sunny, with a high of 21. In 2011, the Vancouver Park Board installed a skateboard park in Mount Pleasant Park. During the construction, residents opposed it. The only resident to go on record (in that article) as being opposed was Doug Leung. At that time, the Vancouver Park Board had a majority of commissioners from the Vision Vancouver party. 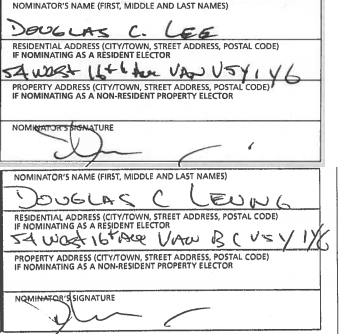 Remember, Douglas C. Leung lives at 54 West 16th Ave, directly across from Mount Pleasant Park, home of the skatepark that Doug Leung complained about in 2011. During the 2014 municipal election, Douglas Leung was the campaign manager for the NPA as evidenced in this story and this story and this story. In the 2014 municipal election the NPA took control of the Park Board from Vision Vancouver. In 2015 the NPA-lead Vancouver Park Board is voting on removing the skatepark based on complaints from nearby residents. So, to recap, Doug Leung complained about the skatepark at Mount Pleasant Park in 2011. In 2014 Doug Leung nominated numerous NPA candidates and was the NPA campaign manager, and now in 2015 the NPA-lead Park Board is responding to neighbour complaints about the skatepark?